If you’re home and looking to kill an hour tonight, NBC’s Hollywood Game Night isn’t the worst way to do it. That’s kind of damning with faint praise, but what can I tell you? Celebrities play parlor games on television with a couple of regular people. The set up is simple: Two teams play (generic, over-produced) parlor games against each other for money. Each team has three celebrities and one non-celebrity (“civilian,” as host Jane Lynch terms them, like it’s Vietnam). The non-celebrity has the chance to win cash, and the celebrity has the chance to win money for a charity of their choosing. The hook here is the human capital. The first episode offers Lisa Kudrow, Matthew Perry, Alyson Hannigan, Kristen Bell, Daniel Dae Kim, and Martin Short. Future episodes will feature the likes of Amy Poehler, Maya Rudolph, and Jason Sudeikis. These are mostly very famous people, real famous people, who cannot need the money, who work, who aren’t like milling around running a tin cup against an iron fence, and yet here they are! Lisa Kudrow and Alyson Hannigan, doing a charades circuit with an insurance broker from Knoxville, Tenn. Matthew Perry silently acting out Far And Away. What are they doing? Why are they here? This tonal dissonance is the source of Hollywood Game Night’s intrigue. Another game involves placing photos of Johnny Depp in chronological order. The whole thing will make you nostalgic for the days when they just ran re-runs of The $10,000 Pyramid from the 1970s and ’80s. You know, a simple guessing game. Despite the plastic, there’s fun in this. Kristen Bell knows what Tostitos Scoops look like. It’s also a good time observing the respective levels of engagement. (Witness “the importance of being present,” as actresses love to tell us.) There is a whiff of…let me put it this way: If you were stranded at a middle school youth group social on a Friday night, forced to play party games, and, begrudgingly, you’re actually having fun, despite avowing that you’d go but you were not going to have a good time, there’s some of that here. Fun you will not admit when quizzed by your parents. Begrudged fun. But it’s not like Sean Hayes and his friends drive around for a few hours, pick up insurance brokers, take them back to a house with a stage that resembles one of those redesigned Morton’s, give everybody one glass of white wine, and force Jane Lynch to deliver weak material to what sounds like it could be a laugh track, as they play Celebrity. The thing is, I think we’d all prefer either to watch these people play $10,000 Pyramid—or else to watch this caliber of celebrity (minus Martin Short) play Pictionary as they drink Dark ‘N’ Stormies at some windswept house overlooking the Pacific, through the golden-hued filter of an HBO documentary special. Either true boom boom boom game show artifice or the artifice of intimacy, like pairing an Instagram feed with sound and joy. 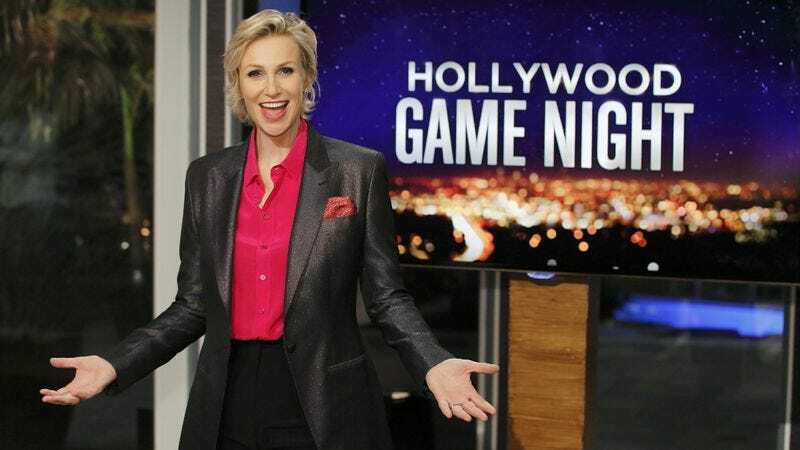 Hollywood Game Night tries to bridge those two, and it doesn’t quite work. But as I said, it’s not a bad way to kill an hour. Matthew Perry tries to act out Far And Away.